Correct inflation pressures and sensible driving habits will increase the service life of your tyres. – Check the tyre pressures at least once a month. – The tyre pressures should only be checked when the tyres are cold. The slightly raised pressures of warm tyres must not be reduced. – The pressures must be altered to suit major changes in the load being carried. – Avoid fast cornering and hard acceleration. – Inspect the tyres for irregular wear from time to time. The tyre pressure must be adjusted according to the load the vehicle is carrying. We recommend adhering to the tyre pressure specifications for a maximum load. The tyre inflation pressures are listed on a sticker on the end face of the driver's door, fig. 261. However, if you prefer an extra-smooth ride and the vehicle is not fully loaded, you can select the tyre pressure for a normal load (no more than three people travelling in the vehicle). However, should you wish to drive with a full load you must increase the tyre pressure to the specified maximum. Under-inflation or over-inflation will reduce the life of the tyres considerably and also impair the car's handling. Correct inflation pressures are very important, especially at high speeds. The pressures should therefore be checked at least once a month and before starting a journey. Do not forget the spare wheel* when checking the tyre pressures. Keep the spare tyre inflated to the highest pressure required for the road wheels. Fast cornering, heavy acceleration and hard braking (squealing tyres) all increase tyre wear. The wheels on new vehicles are balanced. However, various factors encountered in normal driving can cause them to become unbalanced, which results in steering vibration. Unbalanced wheels should be rebalanced, as they otherwise cause excessive wear on steering, suspension and tyres. A wheel must also be rebalanced when a new tyre is fitted or if a tyre is repaired. Incorrect wheel alignment causes excessive tyre wear, impairing the safety of the vehicle. If you notice excessive tyre wear, contact your Audi dealer. • Always adapt the tyre pressure accordingly when the vehicle load changes. • Under-inflated tyres flex more and can overheat at continuous high speeds. This can cause tread separation and tyre blow-out, which could result in an accident. Under-inflated tyres will increase the fuel consumption. The tread wear indicators show the condition of the tyre treads. The original tyres on your vehicle have 1.6 mm high “tread wear indicators” ⇒ fig. 262 running across the tread. Depending on the make, there will be 6 to 8 of them spaced at equal distances around the tyre. Markings on the tyre sidewall (for instance the letters “TWI” or a triangle) indicate the positions of the tread wear indicators. The minimum tread depth required by law in Germany is 1.6 mm (measured in the tread grooves next to the tread wear indicators). Other specifications may apply in export countries. To avoid putting safety at risk, the tyres must be replaced at the latest when the tread is worn down to the tread wear indicators. • Especially in difficult driving conditions such as wet or icy roads, it is important that the tyres have sufficient tread depth. 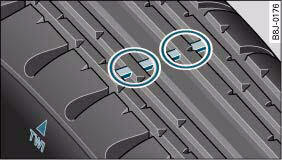 The tread depth should same on the tyres of both the front and the rear axles. • The decrease in driving safety due to insufficient tread depth is particularly evident in vehicle handling, when there is a risk of aquaplaning in deep puddles of water and when driving through corners. Braking is also adversely affected. • The speed has to be adapted accordingly, otherwise there is a risk of losing control over the vehicle. To ensure that the wear is equal on all tyres the wheels should be changed round from time to time according to the system ⇒ fig. 263. All the tyres will then last for about the same time. It is important to use the correct wheels and tyres when replacement is necessary. – All four wheels must be fitted with tyres of the same type, size (rolling circumference) and preferably the same tread pattern. – If possible, tyres should be replaced at least in pairs and not individually (i.e. both front tyres or both rear tyres together). – Never use tyres whose actual size exceeds the dimensions of the factory-approved makes of tyre. – If you wish to fit the vehicle with non-standard rims or tyres, it is advisable to consult an Audi dealer before purchasing them. The tyres and wheel rims are an essential part of the vehicle's design. The tyres and rims approved by Audi are specially matched to the characteristics of the vehicle and make a major contribution to good roadholding and safe handling ⇒ . The sizes of the rims and tyres approved for your vehicle are listed in the vehicle's documents (e.g. EC Certificate of Conformity or COC document 3)). The vehicle documents vary depending on the country of residence. means, for example, that the tyre was produced in the 10th week of 2006. Please note that with some types of tyres, the actual tyre size can differ from the nominal size marked on the tyre (for instance 225/50 R 17 94 Y), and there may be significant differences in the contours of the tyres, even though the tyres are marked with the same nominal size designation. When replacing the tyres, it is therefore important to make sure that the actual size of the new tyres does not exceed the dimensions of the factory-approved makes of tyre. Failure to observe this requirement can affect the clearance needed for the tyres. This could result in contact between the tyres and suspension components or bodywork. The brake lines could also be damaged and the vehicle's safety could be severely impaired ⇒ . When using tyres with the maximum permitted nominal dimensions, this can also void the vehicle's registration. If you use tyres that are approved by Audi you can be sure that the actual tyre dimensions will be correct for your vehicle. If you decide to fit a different type of tyre, you must obtain the appropriate manufacturer's certificate from the tyre retailer to confirm that the tyres are suitable for your vehicle. Keep this certificate in a safe place. Your local Audi dealer will be able to advise you on which tyres may be fitted to your vehicle. On vehicles with four-wheel drive, all four tyres must always be fitted with tyres of the same type, make and tread pattern, as otherwise the driveline can be damaged by continuous variations in the wheel speeds. For the same reason, only use a spare wheel* with the same tyre dimensions as the normal road wheels. It the spare tyre* is not the same type as the tyres fitted on the car (for example if the car has winter tyres or wide-section tyres) you should only use the spare tyre if a puncture occurs, and then only for a short period of time. In this case, please drive with extra care. Refit the normal road wheel as soon as possible. It is best to have all servicing of wheels and tyres performed by a qualified workshop. They have the necessary special tools and replacement parts, trained personnel and facilities for disposing of the old tyres. • It is very important to ensure that the tyres you have chosen have adequate clearance. When selecting replacement tyres, do not rely entirely on the nominal tyre size marked on the tyre; with some makes of tyre the effective tyre size can differ significantly from the nominal dimensions, even though the tyres have the same size designation. Inadequate tyre clearance can result in damage to the tyres or the vehicle, causing a serious safety risk. 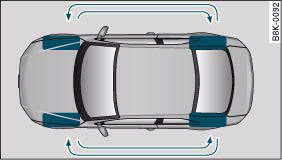 It may also invalidate the vehicle's type approval for use on public roads. • Please ask your Audi dealer or qualified workshop whether run flat tyres can be used on your vehicle. Unauthorised use of these tyres can invalidate the vehicle's type approval for use on public roads. Furthermore, this could cause damage to your vehicle and possibly also result in an accident. • Avoid running the car on tyres that are more than 6 years old. If you have no alternative, you should drive slowly and with extra care at all times. The wheel bolts are designed to suit the rims on your car. The wheel bolts are matched to the rims. When installing different wheels (for instance wheels with winter tyres) it is important to use the correct wheel bolts with the right length and correctly shaped bolt heads. 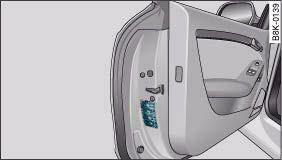 This is essential for the secure fit of the wheels and for the proper function of the brake system. Audi dealers have full information on the technical requirements when installing or changing tyres, rims or wheel trims. The wheel bolts should be clean and turn easily. A special adapter is required to turn the anti-theft wheel bolts*. Winter tyres will significantly improve the car's handling in winter road conditions. – Use only radial ply winter tyres. – Winter tyres must be fitted on all four wheels. – Only use winter tyres of the correct type approved for your vehicle. – Please note that the maximum permissible speed for winter tyres may be lower than for summer tyres. – Also note that winter tyres are no longer effective when the tread is worn down. – After fitting the wheels you must always check the tyre pressures. The correct tyre pressures are listed on the sticker on the end face of the driver's door. In winter road conditions winter tyres will considerably improve the car's handling. Due to their type of construction (width, rubber compound, tread pattern), summer tyres give less grip on ice and snow. This applies particularly to vehicles equipped with wide section tyres or high speed tyres (code letters H, V or Y on the sidewall). Only use winter tyres of the correct type approved for your vehicle. The sizes of the winter tyres approved for your vehicle are listed in the vehicle's documents (e.g. EC Certificate of Conformity or COC document 4)). The vehicle documents vary depending on the country of residence. Also refer to,. Winter tyres are no longer fully effective when the tread is worn down to a depth of 4 mm. The performance of winter tyres is also severely impaired by ageing, even if the tread is still much deeper than 4 mm. In Germany vehicles capable of exceeding these speeds must have an appropriate sticker attached so it is visible to the driver. Suitable stickers are available from Audi dealers and specialist retailers. Please note regulations to this effect in your country. “All-weather” tyres can also be used instead of winter tyres. Please note that the generally applicable 240 km/h speed rating for winter tyres with the letter "V" is subject to technical restrictions; the maximum permissible speed for your vehicle may be significantly lower. The maximum speed limit for tyres with a V-rating depends directly on the maximum axle weights for your car and on the listed weight rating of the tyres being used. It is best to contact an Audi dealer to check the maximum speed which is permissible for the V-rated tyres fitted on your car on the basis of this information. Exceeding the maximum speed permitted for the winter tyres fitted on your car can cause tyre failure, resulting in a loss of control of the vehicle – risk of accident. Summer tyres should be fitted again as soon as possible; they give better handling on roads which are free of snow and ice. Summer tyres produce less rolling noise, do not wear down as quickly and, most importantly, reduce fuel consumption. Snow chains will improve the vehicle's handling on snowcovered roads. – Snow chains can be used on the front wheels only. – Keep your speed below 50 km/h. Snow chains will improve braking ability as well as traction in winter 4) conditions. For technical reasons snow chains may only be used on tyres with certain wheel rim/tyre combinations. Only use snow chains with fine-pitch links. The links must not protrude more than 13.5 mm from the tyres (including tensioner). Remove the chains when roads are free of snow. Otherwise they will impair handling, damage the tyres and wear out very quickly. Four-wheel drive: where snow chains are compulsory on certain roads, this normally also applies to cars with four-wheel drive. Snow chains may only be fitted to the front wheels (also on vehicles with four-wheel drive).